As designers go, Alexander Wang is pretty much the arbiter of cool. But even the most It of the It labels sends pieces down the runway that leave us scratching our heads sometimes. As was the case when Wang showed his Fall 2018 collection last month and, ever so nonchalantly, brought back the 80s claw clip. 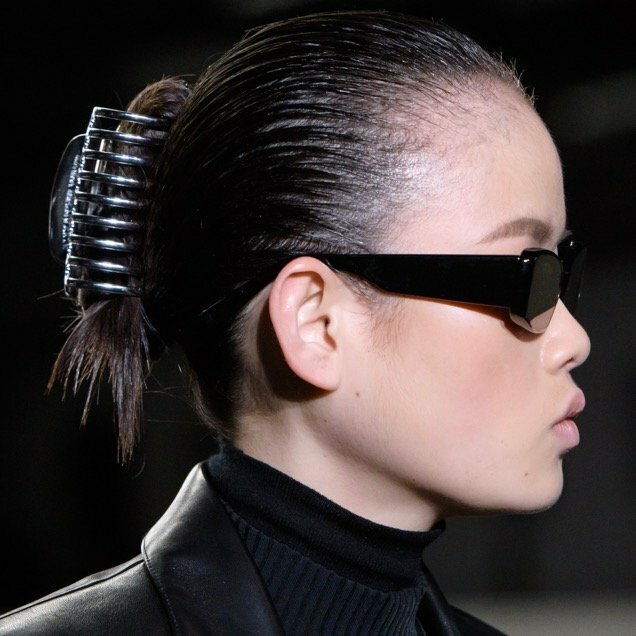 Wang’s show was part 80s, part The Matrix-inspired, so it’s not a total shock that he revived a hair accessory from days gone by. Some of us may still even rock this handy hair holder, albeit not beyond our house or the gym, but it definitely still lives on for many. To his credit, Wang did update the claw clip for the modern woman, executing it in chrome silver stamped with his signature logo. Done right, with slick hair as per Guido Palau’s model updos, well, this runway revival just might be doable in real life. So what to make of the claw clip comeback and whether it will actually become cool again? Well, there’s no word on whether the Wang claw clip will actually be available to buy, so you’ve got some time to mull it over. In recent seasons, we’ve seen Mansur Gavriel usher in the return of the scrunchie with mass retailers following suit, so surely anything is possible. Plus, there’s the added aspect of a young Wang customer who has never seen this clip before, just in case you want to feel totally ancient. Either way, you’ll want to keep an eye out for this trend. And maybe hit your local drugstore to stock up on some look-for-less versions in the meantime.